Whew, that was a lot of work! We finally are in our new place, but still have boxes everywhere. I have pretty much located all of my bento gear, but I am sure I will continue to discover things here and there as we go through the boxes and put stuff away. Today's bento is my first one in 12 days! I missed it, and the yummy food for lunch. My hubby and I have been eating a lot of take out (which he is thrilled about) but I really long for homemade stuff. In this bento: rice, a pepperoni heart with a cheddar cheese house, steamed broccoli from Triple T tossed with soy and black sesame seeds, sauteed shrimp marinated in lemon, soy, and honey, baby carrots, and radishes. I haven't been to the farmers market in two weeks, so I hope to be able to go this weekend and stock up the fridge with seasonal goodies. 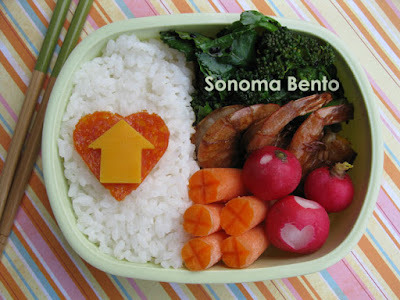 I've included this bento in Shannon's What's For Lunch Wednesdays blog. 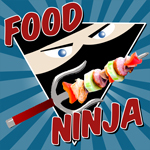 Check it out for great bento ideas! I missed you guys!!! Glad your back and in your new place. Yay! Welcome to your new home!! Thanks Heather! I love my new place and can't wait to have everything unpacked. 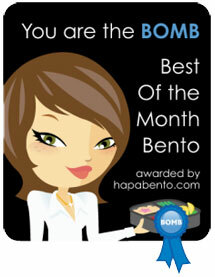 Congrats on your new place and on getting back to bento! This one is so cheerful and cute, love it SB! Thanks so much, Bentobird! A new home and a new start with bento! yea.. a new start and a new place will be a good change. hope to see more of your bentos soon! Thanks so much sheri! I missed you guys too! Thanks so much Yenny! I hope I will find all of my bento gear, ha ha!